Untangled unpacks the struggle women have with feeling like who we are and what we do is good enough. We’re bombarded with daily reminders that we just don’t measure up. And unfortunately, we’re listening. We might feel insignificant as a wife or ineffective as a mom. We might feel worthless because we don’t fit the world’s definition of beauty or battle feelings of rejection because of other women. We may gauge our value based on our income or how well we cook and clean. Or honestly, it could be a million other things. The truth is, there’s no shortage of not-good-enough messages tangling our lives every day. And unless we understand what they’re doing to us and ask God to unknot the insecurities that are choking our sense of worth, we will never have a healthy self-esteem. This book is my story—my journey—to find the good in me, and to learn how to silence the voices that have called me I’m worthless. Chances are it’s your story too. Insecurity is a thread that knits us together as women. The God who created us on purpose is relentless in pursuit of our healing. And He is the only One who can heal our black and blue hearts from the tangles that have bruised it. When we ask Him to heal us, He will. 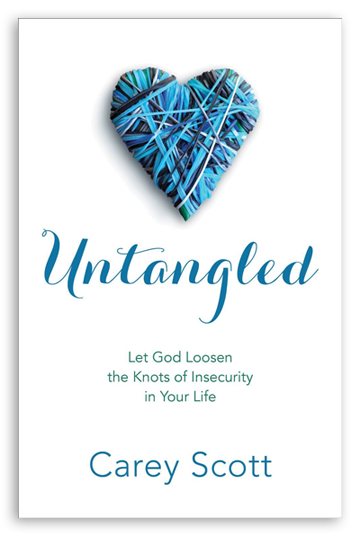 Do you want to be untangled from the insecurities that have knotted up your self-worth? Are you tired of feeling like you just don’t have what it takes? Do you want to find joy in life and contentment with yourself? Untangled is an honest discussion about the things that make us feel worthless. It’s not another self-help book. It doesn’t offer to fix you. And it isn’t full of empty promises. Instead it will challenge you to take a truthful look at your life, revealing the source of your own not-good-enough messages and making a case for why Jesus is the only One who can silence them. Told with humor, vulnerability, and encouragement, this book will connect with the heart of every women.